Entertainment icon, multiple award-winning superstar, breast cancer survivor, Olivia Newton-John delighted music fans of all ages on Saturday November 10th, 2012 at the historic Paramount Theatre in Aurora for a one night only sold-out performance. With a career spanning over four decades, the beloved star’s timeless appeal and world-renowned success have left a remarkable imprint on the world of show business. Showing no signs of slowing down, Olivia Newton-John has maintained not only her vivacious stage presence, but her commanding vocal range appears untouched by time, as does her ageless beauty. The concert stage was transformed into an extravagant production complete with silk curtains, elevated platforms, innovative lighting and “Olivia” projected onto the backdrop. Wearing a pair of sparkly black slacks with a tailored blazer and sequined necktie, Olivia thanked everyone for coming out to the show. She received nonstop cheers and applause from the enthralled audience. Some may tend to forget that Olivia’s career started out in country music. Taking the audience on a journey back to that era, an acoustic medley of “If Not For You,” “Let Me Be There,” “Please, Mr. Please,” and “If You Love Me (Let Me Know)” thrilled fans, but even more notably, her outstanding covers of Dolly Parton’s “Jolene,” and John Denver’s “Take Me Home, Country Roads” sent chills throughout the entire theatre. During these tough economic times, we need the power of love through music now more than ever; Olivia Newton-John blessed everyone with a much needed break from the ultra negativity of the world. Our personal struggles, worries and anxieties were all forgotten if only for a night, thanks to her. I would strongly recommend that anyone who has never seen Olivia Newton-John before to catch one of her live concerts. 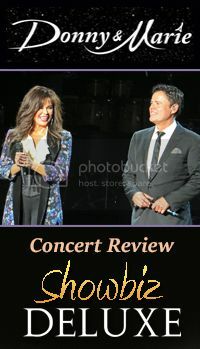 For over 90 minutes, concertgoers are treated to non-stop hits, genuine humor, electric excitement, cherished memories, and the unmistakable voice of one of the most underrated artists of our time. Many thanks to Olivia’s wonderful publicist Michael and friendly road crew for accommodating Showbiz Deluxe for the evening!